The FTSE100, DAX and CAC have made a good start to the trading day, opening up around 0.75% to 1%. The main reason for this is a late surge of bullishness in US markets last night that (as it often does), leaves the European markets playing catch up. Markets have fallen back a little though and the FTSE is a little sluggish compared to its European peers with volatility in Royal Dutch Shell shares not helping. This news has been balanced by the latest figures from the Nationwide showing house prices rose by more than forecast in July. The only other upper tier economic announcement today is US unemployment claims due at 12.30 GMT. The Nationwide housing figures appear to have given investors confidence in the pound this morning. Sterling is in play, rising 0.7% against the dollar and the Yen. 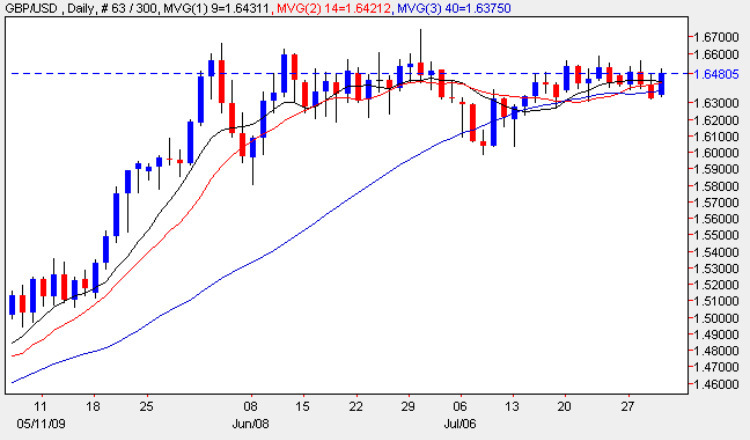 The pounds to dollars pair looks to be the pair in play as traders push it close to the 1.6500 level which has become an overhead resistance level over the last couple of months. Since June, the pound vs dollar has closed above the 1.6500 level four times, but managed close above it again the next day just once. Bear trades or double (down) trades could be a good way to play the pair as it approaches the resistance level once again.